It is the official site of the Portuguese Water Dog Club of Canada. Without a doubt a useful site to learn more about the breed. It contains impartial and general information. It is the official site of the Canadian Kennel Club, the organization that legislates the world of the pure breed dogs in Canada. It is an excellent reference tool to learn more about the different breeds recognized by the CKC and the different disciplines. If you are looking for help with the education of your puppy this site is perfect for you. Even if this site is sponsored by Purina it remains impartial in its content. Some people are wondering about raw food feeding. Is it better for my dog? Does it diminish the risk of developing ? What do I have to do to make sure my dog has everything he/she needs? Lots of questions that need to be answered. 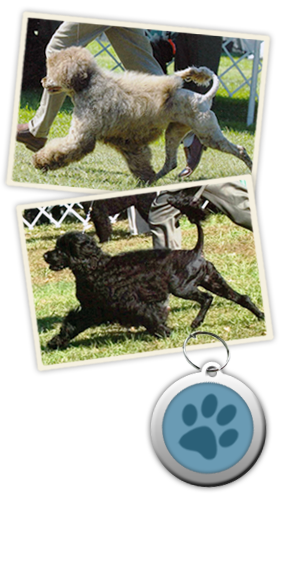 The author of this site is also a Portuguese Water Dog owner and breeder. Roslyn & John have been very involved with this breed for numerous years in conformation, agility, obedience and water work. Roslyn served as president of the Portuguese Water Dog Club of Canada from 2003 to 2008. Her graphic design firm help develop our web site (Roslyn Eskind & Associates). Mari & Herb are also passionate Portuguese Water Dog people – very involved with the Ontario chapter as well as with the National club. Herb is knowledgeable about Portuguese Water Dog pedigrees and Mari is in charge of our Canadian rescue program. Kris is an artist, owner and breeder of Portuguese Water Dogs. Her web site reflects her interest in all these aspects of the breed.